Its that time! Time to share the third and final part of our ottoman building adventure, because we are excited to say ….. ” Ta dahhhhh! Our ottoman is officially finished!!! “. So, basically what we are saying is ….. hold onto your hats, because this is going to be one long (but hopefully interesting) ottoman related post …. in fact, if I were you, i’d go make a cup of tea now, because this could take a while. First thing first we had to cut our foam to exactly the right size for the base. The nice people in the store had cut it pretty roughly for us when we bought it, but it definitely needed a bit of a tidy up to make sure the ends were good and square. So we measured out square ends using a set square rule and marked it out with a sharpie pen. Next came fixing the foam to the wooden base. This step was surprisingly simple. 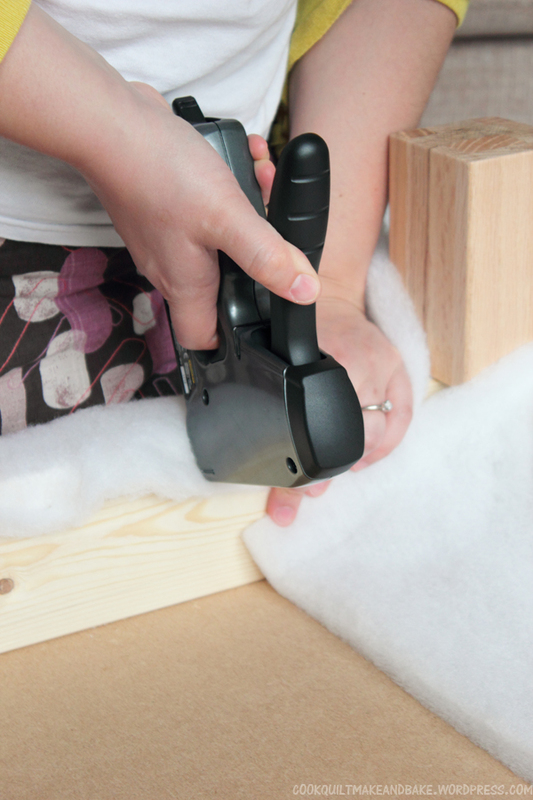 We knew that we needed to glue the foam down (especially since we were using two layers to make it extra cushy, and because we didn’t want any foam-slipping related disasters) but the idea of busting out adhesives on foam gave us cold sweats. 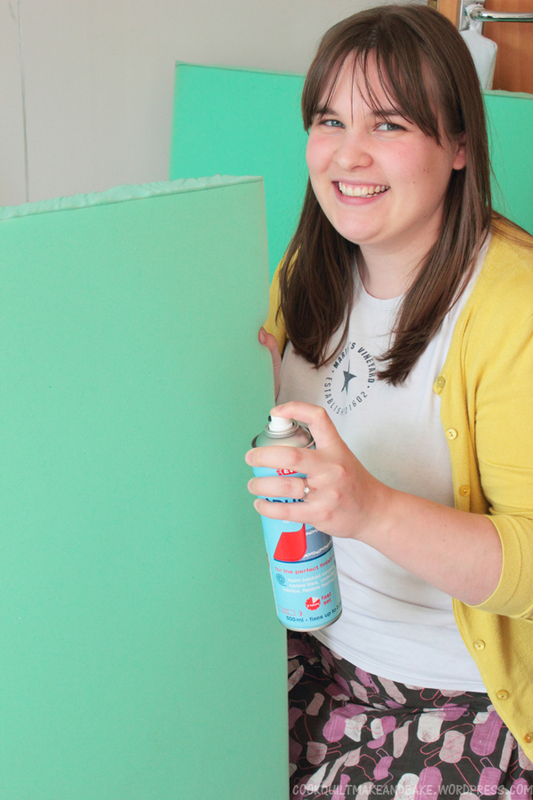 We both had horrible ideas of our lovely foam melting as soon as the glue touched it (a bit like polystyrene). But, luckily, Phil was on the case, and after a bit of googling, decided our best bet was to try using spray on foam and carpet adhesive which he had found recommended on a few upholstery websites. Luckily our local hardware store had exactly what we needed and it was pretty cheap (I think it ran to around £5 per can). Also, the process of applying it was surprisingly smooth. We followed the instructions on the bottle which suggested spraying both sides to be fixed with a thin coat of the adhesive, and then leaving them for 1 – 2 minutes to become tacky before pressing them together. 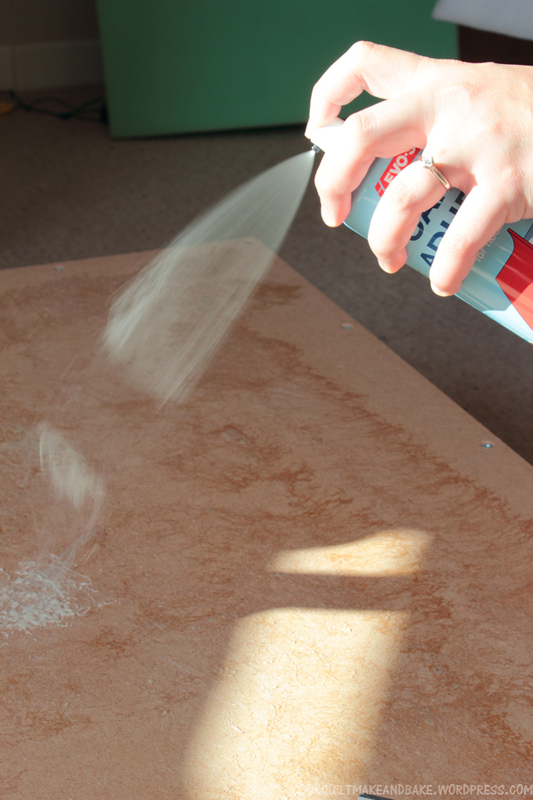 The odd thing about carpet adhesive is that it actually comes out kind of thick, a little bit like silly string. But, this is good because it means it is easy to control the spray of the glue, and see exactly where it is going (ie. not on your skirt, the floor or in your hair). Here is one good thing to note too, once you have stuck the two layers together, they are stuck!! I mean seriously … not going anywhere. I was a little bit skeptical when I heard the word ‘spray adhesive’ as I was having flashbacks to school poster projects which used ‘repositionable’ aka. not very sticky at all spray adhesive, which managed to gunk up everything in sight. Ick. But, I was really pleasantly surprised with the carpet glue. It also really wasn’t especially fumey when we had done it, but we still opened our big lounge doors and popped the ottoman by them to let it gas off a little while it dried over night. 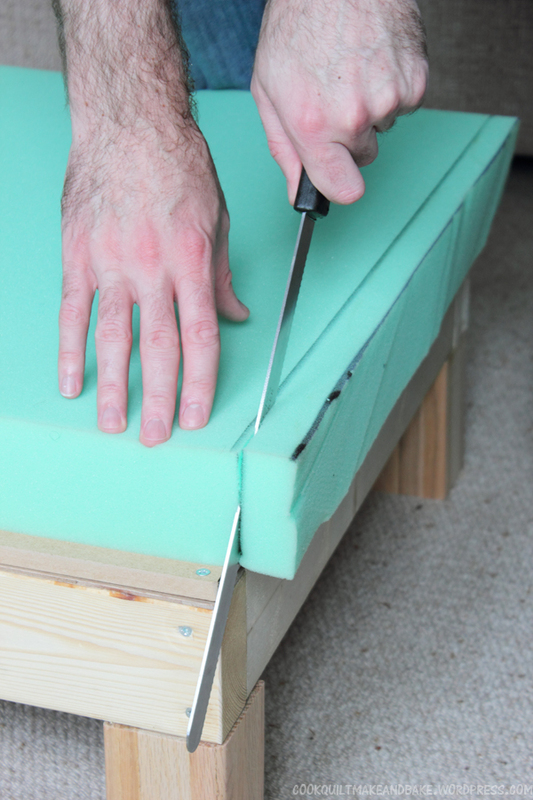 The next day, we decided it was time to start the actual process of upholstery! And it was the batting’s turn first! We bought our batting at a local fabric shop, and it cost the surprisingly cheap sum of £3.50 per meter . The store had two options, 2 oz or 6 oz so we opted for 6 oz to make it super squishy. 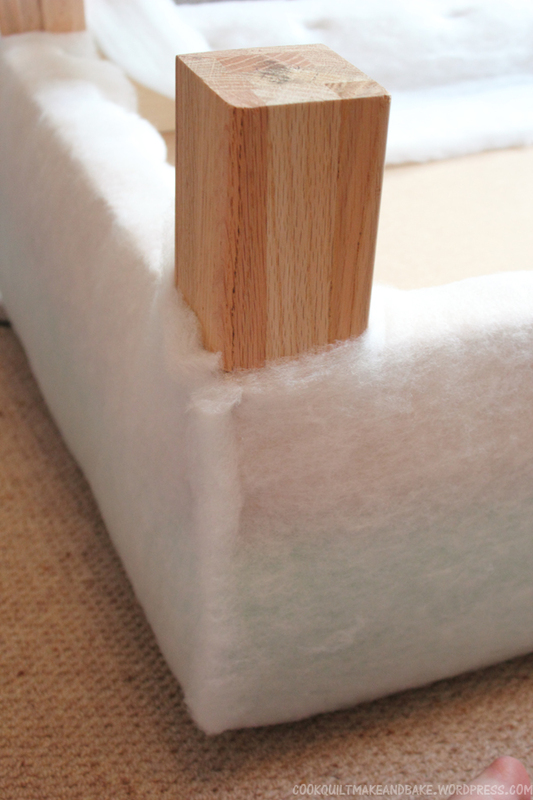 To apply it, first we placed the batting over the top of the ottoman and centered it so we were happy that we had plenty to cover each side and reach all the way underneath, where we were planning on hiding our staples. 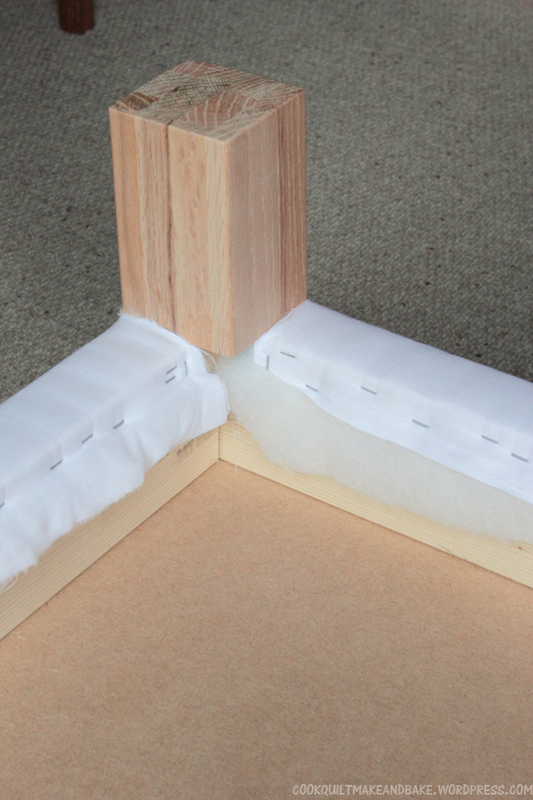 Then, we placed a staple in the middle of each side just to anchor and secure the batting in place. The first one needed no tension on it, but for all the others, we had a system going where Phil took hold of the fabric with both hands and applied even tension to keep the batting taught over the ottoman, while I popped the staples in. Once we were done, we used a craft knife to carefully cut the batting flush around the legs. 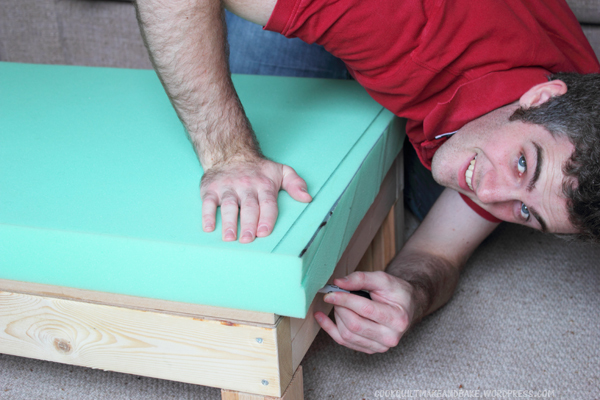 A word on our staple gun: Phil and I have tried a few basic upholstery jobs before (just recovering dining chair seats really) and had been plagued with rubbish horrible staple guns which jammed every 2 minutes. So, for this project, where we knew that good stapling was going to be key, we splurged and invested in a new gun (not an expensive one, just a new one). Its a ‘Stanley Sharp Shooter’ (pretty fancy name huh! ), cost £20, and we couldn’t be happier with it! It has worked like a dream for the whole project, so we are def going to hang on to it for future projects (and nope, as ever we wern’t payed or perked to say we like it, we just share the love when we come across something we thing is great!) 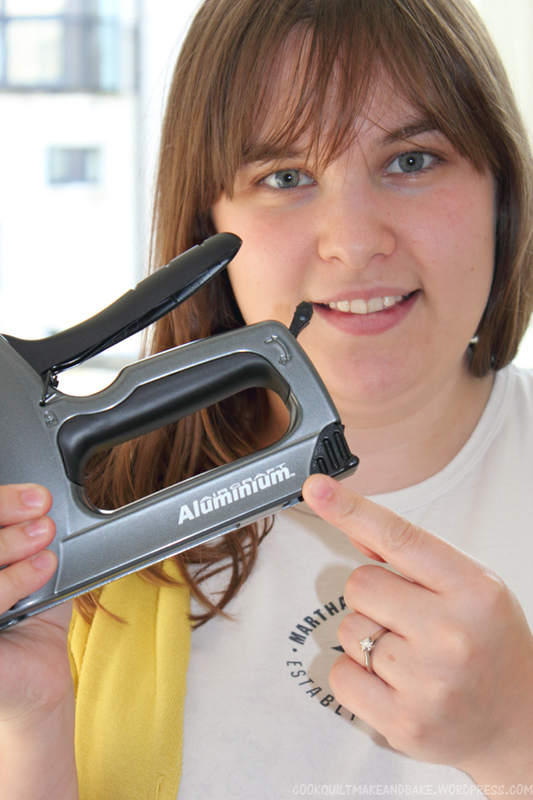 Phil would also like me to point out that his favourite part of the staple gun is that the body is made of ‘aircraft aluminium’! I’m not sure what the significance of that is, but I think it makes it pretty fancy in his eyes! 😀 …. he even made me take a picture with it, lol. Deary me (this is my slightly skeptical face). Once we had stapled all the way around the sides, we had the corners to do. For the batting layer, we just decided to cut the batting flush with the corner so the edges lined up nicely, staple it in place and leave it at that (the corners get a little more complicated in the next few layers, but we knew the batting was always going to be covered, so as long as it sat nicely in place we were happy). The exciting thing is that once the batting was on, it very much was starting to look a like an ottoman, not the skeleton of an ottoman, so we were psyched. The next layer to tackle was the calico. If you look online, lots of upholstery sites use hessian rather than calico, but we knew that we just needed a good strong (but not expensive) cotton underlining to give a smooth and taught layer for our final fabric to sit on, so a calico seemed like as good an option as any. We bought our calico at the same time as our batting, in a local fabric store and it cost £3 per meter, so cheap as chips. Again the process was pretty simple, although a bit more time consuming than the batting as we had cornering to contend with. Just like the batting we layed out the calico over the ottoman to make sure it was centered and then stapled our way around the edges, starting in the middle and working our way out to the corners, placing 1 staple in one side, then switching to the next side and the next, to make sure our tension stayed even across the top of the whole box. 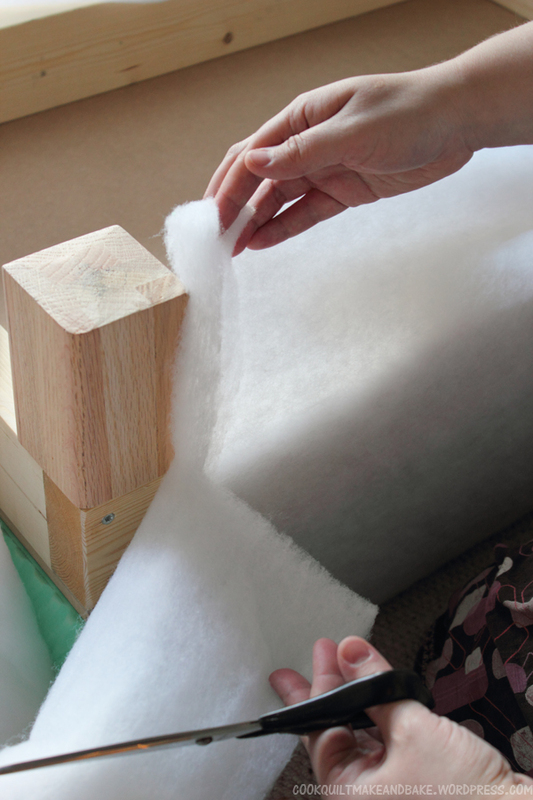 When it came to the corners, we trimmed the calico to fit around the legs, and trimmed off any major excess, and then folded the corner into a triangle (just like wrapping a present), which we tucked inside. We then held it firm with a few staples. We were a little concerned that the extra triangle fold would add too much bulky fabric under the corner, but actually the calico is so thin it didn’t make any difference. They weren’t necessarily the prettiest looking corners and they were veeerry fiddly to get right …. picture us listening to two entire games of olympic tennis while we tried to sort them out. But in the end they held the foam and batting taught and gave us a nice smooth firm surface to apply our final outside fabric over. Here’s what it looked like underneath once we had finished stapling the calico. We then took a break from working on the ottoman for a whole week. We both had work commitments that we needed to get on with, and we had reached a bit of a hurdle, namely, choosing our final fabric!! 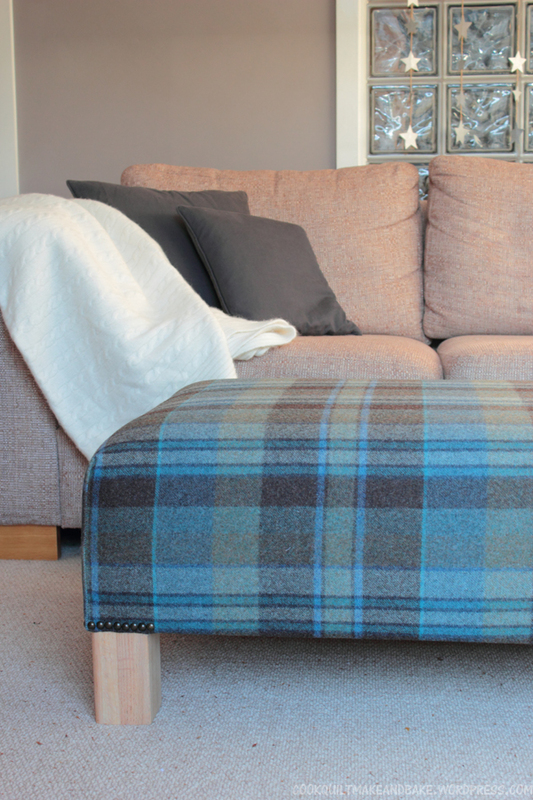 We knew that we love loved the beautiful thick woolen tweed upholstery fabric from Anta, which is what was used on our inspiration ottoman, which you can see here. But, at £85 per meter, (and when we calculated we would need 1.6 meters to cover the ottoman) we just couldn’t justify the price tag. So, we decided to go on the hunt for something similar but slightly closer to our price range. Later that week, we popped into John Lewis, a local department store, to have a peek at their collection of upholstery fabrics. They usually have a pretty good selection, so we thought this might be a good place to get some ideas. Which is where we stumbled across the Abraham Moon selection of upholstery wools. They were exactly what we were looking for. 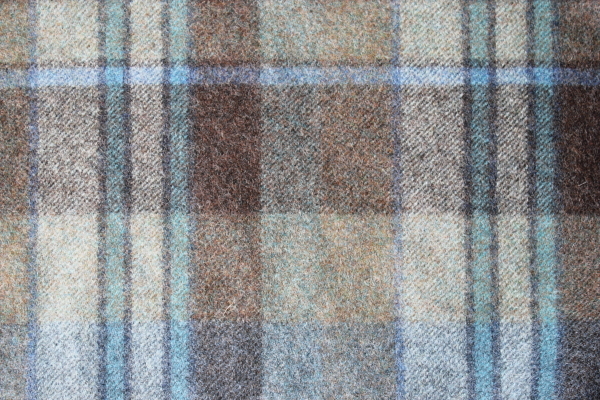 Thick, hard wearing, and they had a huge selection of pretty colors and tartans to choose from. We also loved that their wools were made in right here in the UK, in a mill in Yorkshire, so they are lovely and home grown. Yipee!! We were still a little hesitant at the price tag (around £50 per meter) but we decided to order some free sample swatches from them, so we could at least get a better idea of what they would look like in our sitting room. But, in the end, as none of them were quite right, we decided to sleep on it, and keep looking. If we were going to have to pay that much for fabric it had to be exactly the right fabric! So, a couple of days later, we were driving past our local fabric store (the self same one which we had got our calico and batting from a week earlier) when we saw that they had a 10% off sale. Never one to pass on a sale we popped in, and there, in a corner, looking all thick and wooly and lovely, was a whole pile of Abraham Moon wool fabrics on the roll, just waiting to say hello. And, at the bottom of that pile, was this beauty! Its called Antique Collection, Longleat in colour ‘Glacier’ and we knew instantly it was exactly what we were looking for. It actually reads more greeny/turquoise in person, but it is brown enough to match our curtains, blue enough to bring a pop of color into the living room and with the odd teeny bit of green in it which pulls in the map are we have on the walls in the lounge. The extra exciting bit was that, because the store already had the fabric on the roll (rather than needing to order it from the manufacturer) it was priced at only £35 per meter, with an extra 10% off, which ended up being £31.50, and we needed 1.6 meters, which brought us to a grand total of £50.40. Not cheap, but sooooooo much better than the £136 the original Anta fabric would have cost us. So we bit the bullet and bought it there and then. And, once we got it home, we knew right away it was the perfect choice. 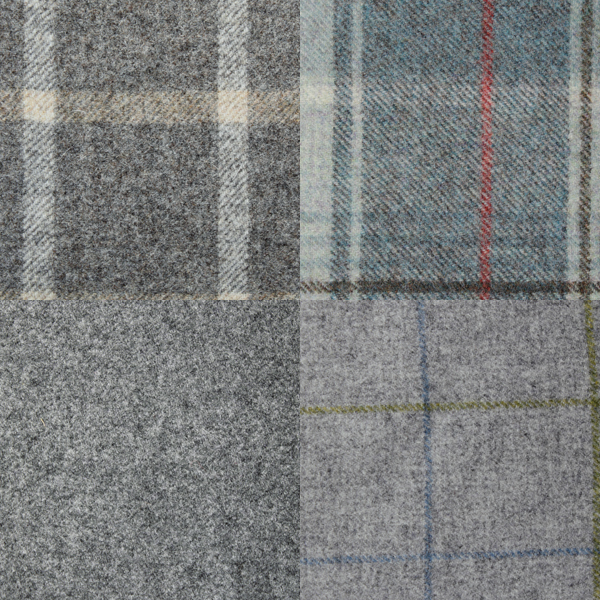 We love that it is so rugged and durable, but super soft, and not at all scratchy like some woolen tweeds. Plus, it is perfect for our little Scottish house. So, onto the final step. 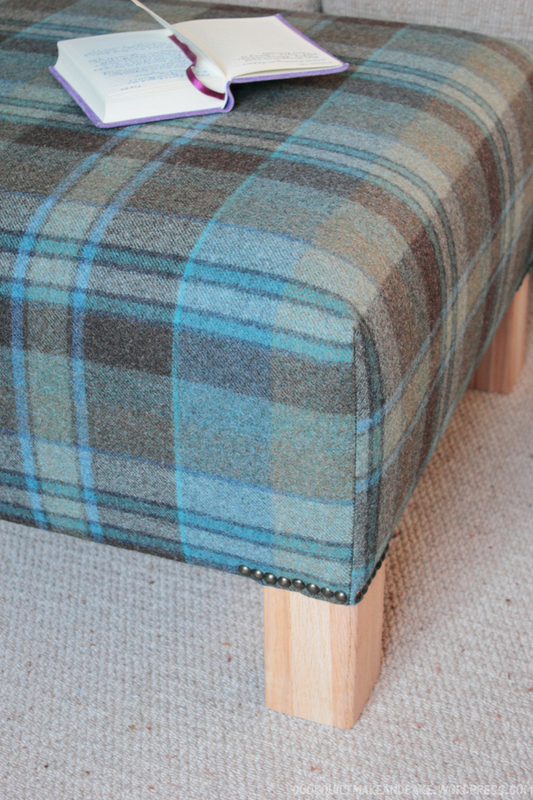 Covering the ottoman in the woolen fabric. 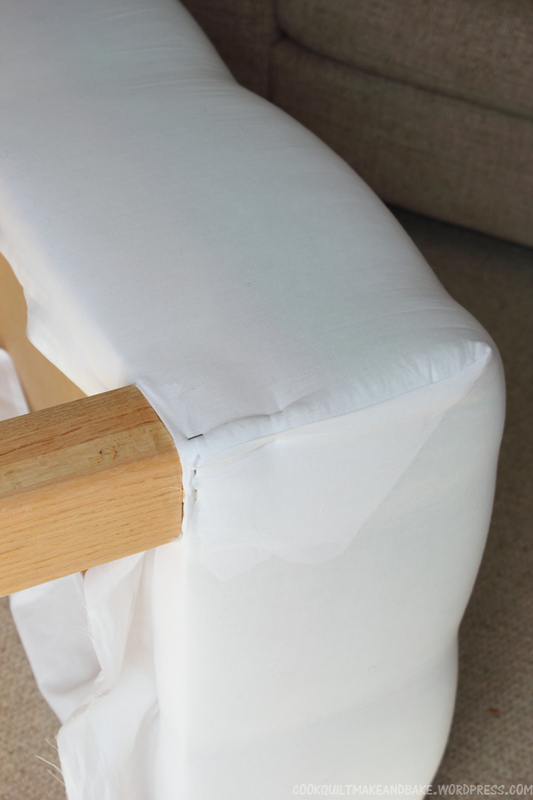 We had done a lot of reading in the previous week and watched a fair few online videos of people upholstering various bits of furniture, so we had gathered that the best plan would be for us to sew the corners into nice seams, to create a sort of slip cover for the ottoman, which we then stapled underneath. 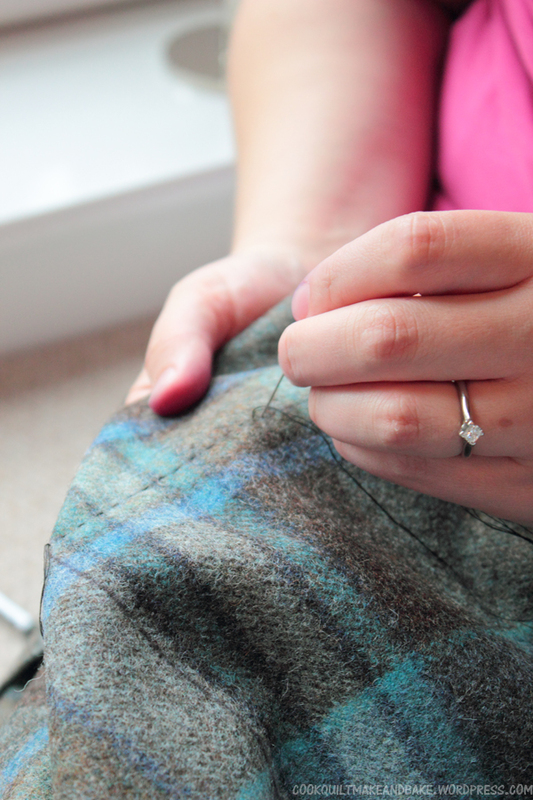 But for some reason, the idea of sewing our lovely wool into a slip cover filled me with a bit of dread. I had visions of a nasty saggy baggy covers which wrinkled and didn’t sit tight, but others seemed to have had success, so I gave it a go. 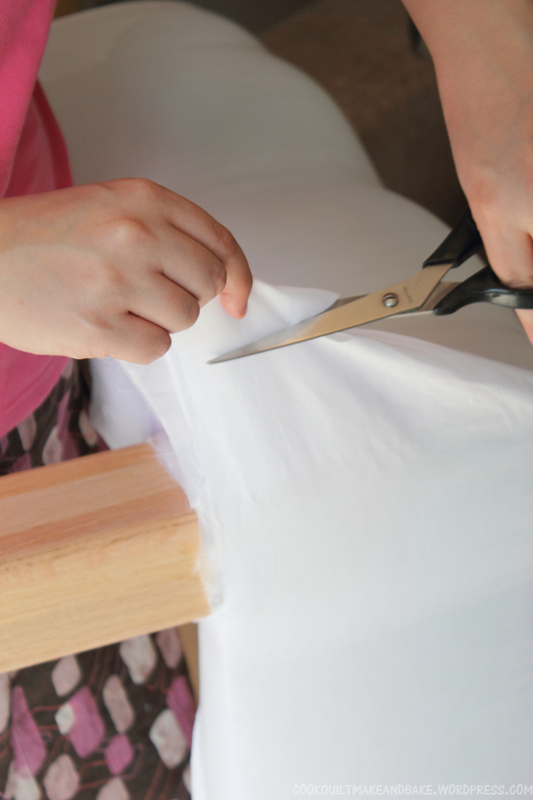 We measured out the size of the top of the ottoman onto the fabric (making sure out lines were straight, no one wants wiggly check on their furniture) and then measured out the length down the sides, just as if you were making the net for a cube. 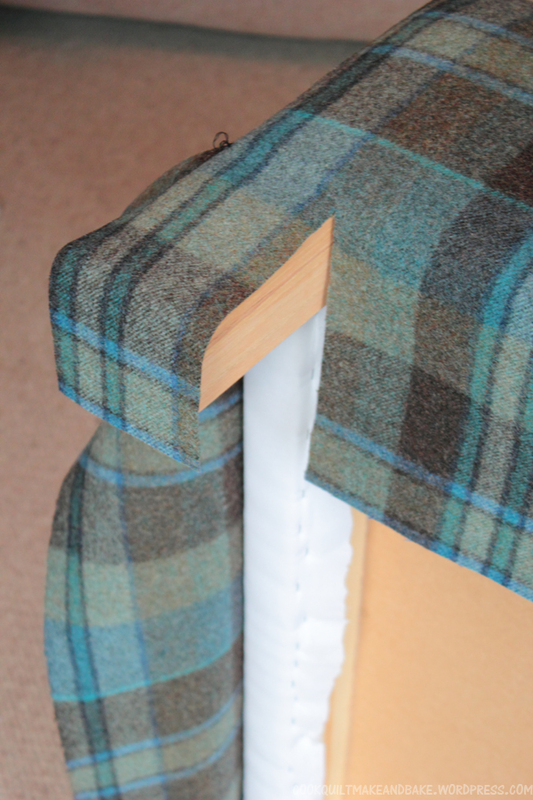 And then I just sat and sewed the two side lengths together, just as if I was making a slip cover for a sofa. I actually decided to sew the sides by hand. My old sewing machine is very trusty, but I just didn’t think he would cope with the two thick layers of wool, plus I always feel like a have a little better control with hand sewing. To make sure my sides were extra tough I used 3 strands of extra thick thread (which I already had in my sewing basket) and double sewed them with a running stitch. I left long tails at the end in case we wanted to just tighten the stitches a little once it was on. And miraculously it worked first time. 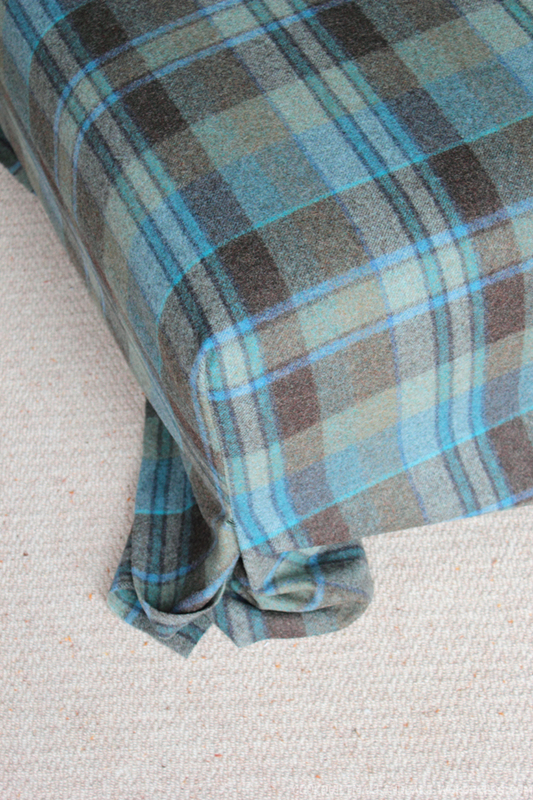 The fabric fit snuggly round the ottman with no saggy wrinkles or lumps and bumps. All that was left to do then was to trim the fabric around the legs (we also trucked it under, given about an extra inch inside so we had a nice finish with no raw edges) and staple it in place, just like we had done the batting and the calico. To finish the whole piece off, Phil bought some brass upholstery tacks from our local hardware store (price: £2.50 per box of 50, and we bought 2 boxes just to be sure) and hammered them in with a pin hammer around the legs so it looks pretty and finished, and to make sure the fabric around the legs stayed put. And here it is finished. Ta dahhhhhhhhhhhhhh! We are super super pleased with it. It is comfy, and functional and everything we hoped it would be. For sure, it took us a long time to complete (about 5 solid afternoons of work) and neither of us could have done it by ourselves … Phil is the wood work brains in our house, and I am the fabric person. But, from stuffing the foam into our suitcase to bring it home from America, to finding and sanding our old coffee table legs, every bit of it has been fun and challenging! Not bad when the one we liked would have cost us £875 in store, and we still have oak left from the table, and some wool fabric cuttings left to do more projects with! So, there you have it 2854 words on the final part of our ottoman. If you made it to the end, we are seriously impressed lol. We both love doing big projects like this together, so you can bet we will have another one on its way pretty soon. So, what did everyone else spend the last few weekends doing? We are totally hooked on the Olympics (can you tell from our photo) and enjoying a few days of warm weather! 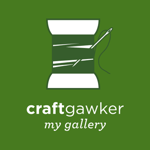 This entry was posted in Make and tagged craft, diy, fabric, footstool, furniture, interiors, ottoman, sewing, upholstery, wool. Bookmark the permalink. It is beautiful. Great job guys! You did a fantastic job, and it came out a whole lot better than the inspiration you posted! great job! You both did a great job!! I love the fabric and the work you both did. It’s much nicer to have it custom made for you. Isn’t it nice to be able to each have a hand in the process? I had to laugh when you said you carried the foam back from the US in a suitcase. I take it they didn’t have to open your suitcase, I’m just imagining the look on the inspectors face. 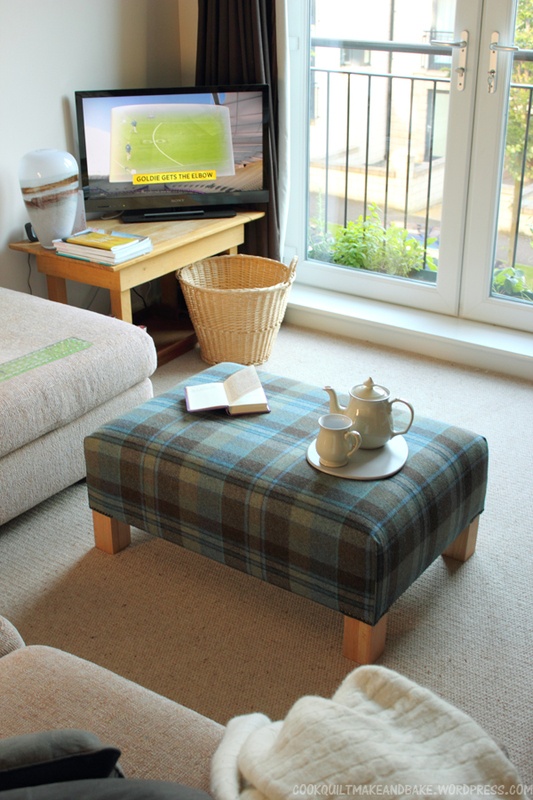 That is a fantastic ottoman! Love that you used wool milled in Yorkshire too. Nice job. 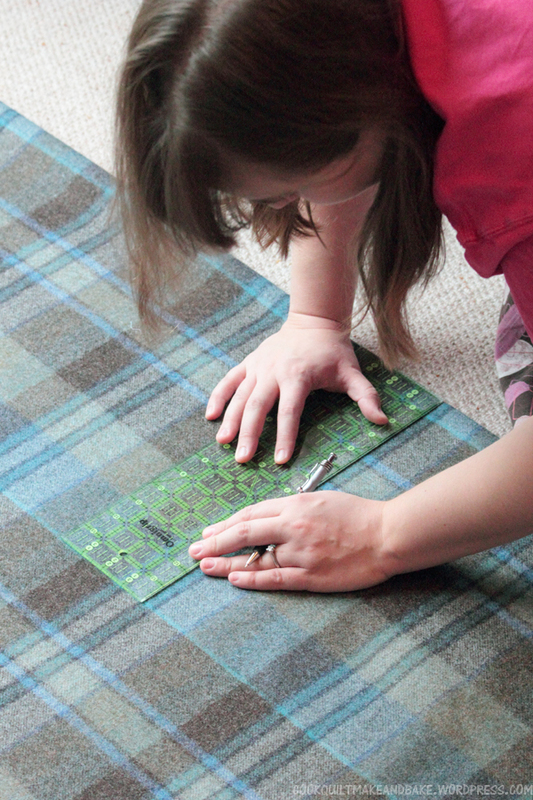 Like the plaid fabric. This is such a great idea! 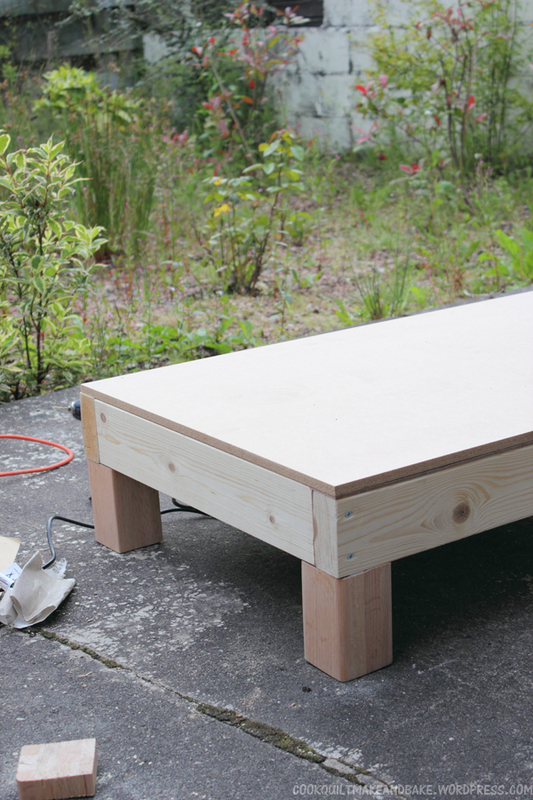 I am actually looking for a new coffee table for my living room and never really thought of making this myself! My table now has the sharpest corner and a glass top leaving it not too baby friendly and this would be perfect. I love the idea of using whatever fabric I want too! Thanks for enspiring me to do it myself and stop looking!